The Economist called Mavericks at Work “a pivotal work in the tradition of In Search of Excellence and Good to Great.” Billy Beane, general manager of the Oakland A’s, called Mavericks “a competitive playbook for the 21st century.” The Financial Times calls Mavericks “a defiant act, a bold and idealistic declaration of faith” in the power of business as its best. What does it mean to have a winning competitive strategy when the world keeps getting more and more competitive? How to you make enduring connections with customers when customers have more choices and higher expectations than ever? What’s the smart way to unleash innovation? Where do new ideas come from? How do you attract more than your fair share of the best people in your field? How do you win the battle for talent? The core message: Business as usual is bust. In industry after industry, the old guard is cutting back and losing ground. Meanwhile, organizations and entrepreneurs that were once dismissed as upstarts, wildcards, and outliers are making waves and growing fast. There’s a reason: In an age of hyper-competition and nonstop reinvention, the only way to stand out from the crowd is to stand for something truly original. Mavericks show you how—by helping you to rethink your strategy, reinvent your approach to innovation, reconnect with your customers, and rediscover the power of your people. The strategies, tactics, and advice in Mavericks at Work grow out of in-depth access to a remarkable collection of 32 forward-looking companies. From a culture-shaping television network with offices in sun-splashed Santa Monica, California, to a little-known office-furniture manufacturer rooted in the frozen tundra of Green Bay, Wisconsin, from glamorous fields such as advertising, fashion, and the Internet, to old-line industries such as construction, mining, and detergent, the organizations featured in Mavericks at Work are winning big at business by rethinking the logic of how business gets done. Individually, these maverick companies are attracting millions of customers, creating thousands of jobs, generating tens of billions of dollars of wealth. As a group, they demonstrate that you can build successful organizations around high ideals and fierce competitive ambitions, that the most powerful way to create economic value is to embrace a set of values that go beyond just amassing power, and that business, at its best, is too exciting, too important, and too much fun to be left to the dead hand of business as usual. 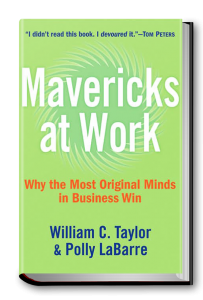 The goal of Mavericks at Work is to provide a fresh alternative to business as usual—an eye-opening, energetic, flat-out useful set of ideas and case studies that is as true to the maverick spirit as the break-the-mold ideas it champions and the unconventional leaders it chronicles. 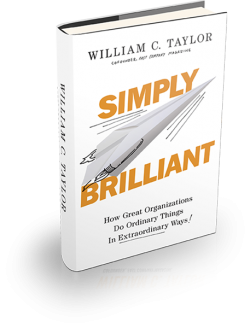 The book helps you to think bigger, aim higher, and win more decisively.